In 1981 Dina Ousley and George Lampman founded Dinair inc, the first company to offer a proprietary airbrush makeup formula and to make it available to the public at large. 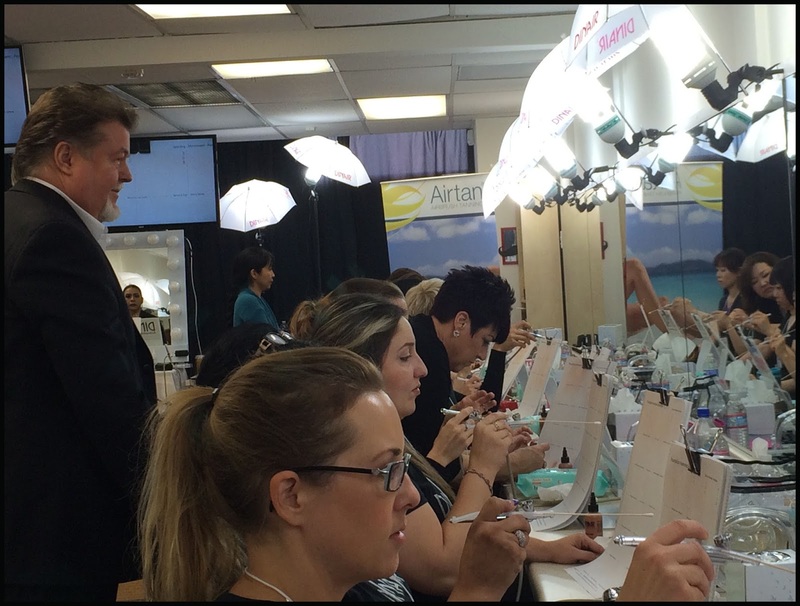 Over thirty years later Dinair has become synonym with airbrush makeup not only in the United States, but all over the world. It is now one of the "best kept secrets" in the industry at pro level, being used in countless productions (including a very, very famous period drama that we all love) without actually being credited. 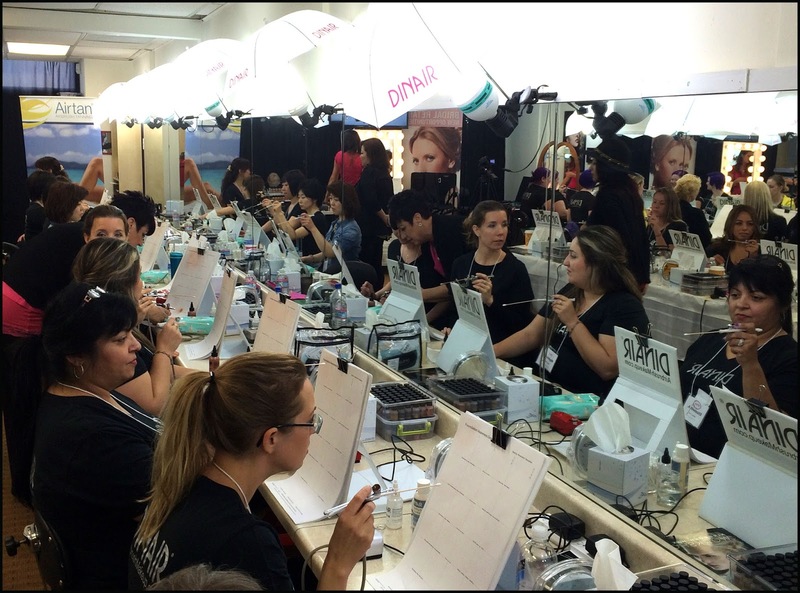 At the same time Dinair has reached hundreds of thousands of home consumers, who have turned from skeptical to addicted in the space of a makeup session. Like so many other makeup artists and enthusiasts, I started my own journey in airbrushing when I opened a white cardboard box sent to me exactly from these very premises we are about to visit today. We actually stopped here two years ago, but having just started this website we wanted to build our content, our experience and our reputation with our followers before offering a closer look at this fundamental company. A few phone calls to Dina's wonderfully efficient assistant Dasia and a 15 hour flight later we have come full circle as we step through the door of the Dinair Studio at 5315 Laurel Canyon Blvd. The Dinair building blends well with the others on its street, with only a small sign indicating the brand's presence on the premises. Once you park at the back and walk through the green Studio door however, you immediately realize that you have arrived at the heart of this legendary company. The Studio itself is a well equipped, medium size room where walk in customers can come and not only shop the entire product line, but also have a skilled Dinair artist help them try the products on, and receive valuable information on how to achieve the same results at home. As we step through the door, this is exactly what is happening. Dina Ousley herself is supervising a color match on a visiting makeup artist who is trying out the product for the first time. Dina welcomes us and we are immediately swept away by her energy, her warmth and her enthusiasm. If you have seen videos featuring this lady, know that you will not be disappointed should you be fortunate enough to meet her: she is exactly as she appears, embodying the spirit that drives her company with such a joy and a vibrancy that you would think she started the whole operation just three months ago, rather than over 30 years back. She immediately makes us feel right at home, and then... we're off to lunch! As she very often does, Dina is showing her support for a charitable cause today, and she is kind enough to take us along with her. This gives us a chance to chat and to get to know each other, and for me it is a great opportunity to gather more information for the profile interview that I have planned and that I will publish soon. We are back at the Studio, and it is now time for our tour of the operation. Dinair actually occupies five adjacent buildings on the same lot, where everything that the brand needs is produced or assembled. Having everything on site cuts production times significantly and gives the company amazing creative freedom. For example a new colour for any given line can be formulated, mixed, bottled and labeled right here on the premises, and a fully equipped video studio means that the promotional material can be shot on site. Dina takes us through the color mixing room, the equipment assembly and maintenance line where each airbrush kit is assembled and manually tested, and the huge stock room where thousands of bottles of color are ready to be shipped, and where the kits and the Internet orders are assembled. There is also an IT room where many technicians are busy at the computers constantly updating the website, and of course a mini studio set up for live video Skype lessons, a service that very few companies can boast. 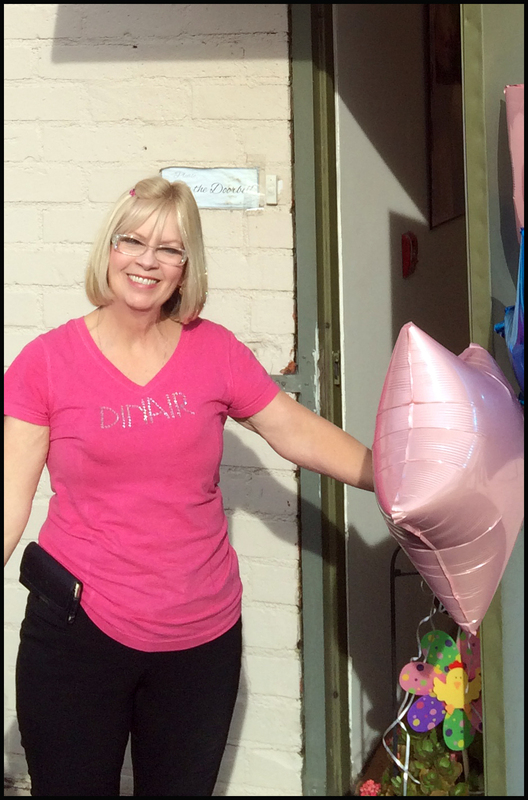 There are about one hundred employees at Dinair, yet the atmosphere is happy and informal, and everywhere we go we are met with warm smiles. This is nowhere truer than in the large Customer Service room where many operators are assisting customers from all over the Country and the world. The girls working here are Dinair's front desk and they know it: all of them wear beautifully airbrushed makeup that they expertly applied, and looking at them is like watching a live presentation on Dinair's latest products. 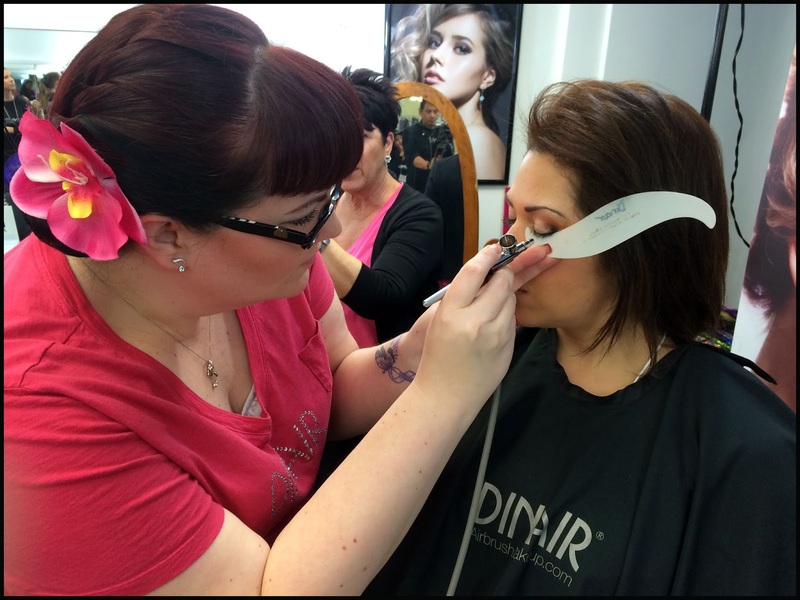 All of Dinair's Customers Reps are of course certified Dinair instructors, like the amazing Tasha Boyd who will be one of the teachers at the next course in just two weeks. Education is a truly fundamental part of Dinair's activity. Courses are held regularly all over the US and in many foreign countries, but nowhere more often than right here in the perfectly equipped room that opens up right from the Studio. We will be back here in two weeks to finish our interviews and we will witness some of that in person. Students flock here literally from all over the world, from South America to Japan with translators in tow. The training is intense, but it takes place in an exciting, positive atmosphere that will leave everyone elated with a great sense of accomplishment. There are some great makeup artists ready to assist the students and to give them the necessary individual attention, and of course there are Dina and George themselves, so you can really say that you have trained with the originators. We often say that Makeup is a very dynamic business, where innovation is vitally important. I have never seen this applied more to the letter than at Dinair. Since I started following them this company had done nothing but grow, but never so much as in the last two years, when every single aspect of the production from makeup to equipment and even packaging has been improved and expanded. Just over two years ago a new, sleeker and quieter version of the Dinair compressor was launched, and the makeup bottles were redesigned with new lids that finally allowed a completely mess free dispensation of the makeup. Shortly after the Colair line was launched, and later still a new airbrush started being distributed in the pro kits, later to replace the old JX model for good. The Hair Colair line was then added, and shortly after the Colair Electric colors finally replaced the old Bright line. A first successful foray into lip stains called "Pucker Up!" is being followed right now by new colors, and most importantly a revolutionary product called Colair Extreme was introduced just weeks before our visit. Over the next few weeks we will publish much more content dedicated to Dinair, and we have shot three video tutorials demonstrating its amazing lines. Until next time, here is a breakdown of the many products this company offers. Glamour line: Water based. Finest, most undetectable application, with great coverage and staying power. 20 foundation shades plus 5 adjusters and 5 concealers. 24 matte colours for blush, lips, liner and eyeshadows, and 20 more Shimmer colours for eyeshadows and highlights. Paramedical /Camouflage line: alcohol based for more durable, water proof coverage of skin imperfections, can also be used for tattoo coverage. 20 foundation shades (same colors as the Glamour line above), 5 concealer colors and 2 adjusters. Fantasy line: alcohol based for special effects and body painting. 12 matte colors. Colair Radiance line: water based. More pigmented for improved coverage, comfort and durability. 20 foundation shades (same colors as the Glamour lines, but identified by numbers). Colair Opalescent line: water based. An ultra pigmented, ultra durable line of opalescent and shimmering colors. 12 basic shades always available, but many more special edition colors are often released for a limited time and available in the "collections" part of the web store. Colair Electric line: Alcohol based. Ultra pigmented neon colours for face painting or for bold eyeshadows. 7 matte colors. Colair Xtreme line: Water based. The most durable and blocking coverage available. Water proof, rub proof. Suitable to conceal serious skin imperfections and for tattoo coverage with no need for prior color correcting. 14 shades available identified by numbers, matching the most popular colors in the Glamor and Radiance lines. Hair Colair Highlights line: 12 shades allow you to create highlights on visible on any color of hair, even dark tones. Hair Colair Shadows line: 7 shades allow you to temporarily cover visible scalp patches or hair roots. Please click here to access a comprehensive illustrated printable color chart directly on Dinair's Website. PRO TIP: If you can't find a particular color from any of the lines, or if you wish to purchase a color that only seems available as part of a collection, insert the color name in the Dinair website search engine: you will find what you are looking for in its own individual page and ready to be added to your basket.